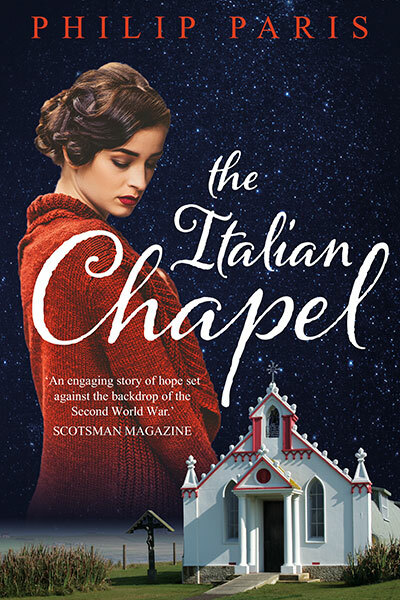 … an historical fiction about the creation of the chapel built in Orkney by Italian prisoners of war. The Italian Chapel is based on an incredible true story. At the beginning of 1942, around 550 Italian prisoners of war arrive at Camp 60 on a bleak, previously uninhabited, Orkney island. Despite the harsh weather and working conditions, a group of talented artists creates a beautiful chapel using mainly scrap material and concrete. Today, the building is regarded as a great symbol of hope and peace and a monument to the ability of the human spirit to rise above hardship and hurt. Link to the radio interview on the Shereen radio programme. ‘A straightforward good read bolstered by some solid research which helps make the tale all the more believable.’ Ross-Shire Journal. ‘When I moved to the Scottish Highlands in 2005 I had several ideas for plays that I had been unable to attempt because of a busy/demanding career in media relations. The move from Kent represented a huge change in lifestyle. I was determined to write these dramas. However, Catherine and I went to Orkney that year on honeymoon and we visited the chapel. I was instantly hooked on the story and began what turned into a quest to find out everything I could about its creation. ‘Over the following three years I spent every spare minute researching the chapel’s history and writing The Italian Chapel. I made a great many friends as well as some extraordinary discoveries about the men behind the building’s creation. This included unearthing the closely guarded secret love between the Italian blacksmith who built the roodscreen and a local Orkney woman. He left a token of his love in the chapel, but no-one had ever realised its significance. The title was published in large print (2010) by BBC Audiobooks in both hard cover – ISBN: 978-1-408-46048-1 and soft cover – ISBN: 978-1-408-46049-8. BBC Audiobooks also produced an unabridged audio version, with a fantastic reading by the actor David Rintoul – ISBN: 978-1-4084-6429-8. Listen to an extract – link to audio on Amazon.